Ok. I'm in a bit of a hurry here. For 1. I can hear my little guy rustlin' around, about to wake up from his nap. For 2. I have to document this project before my husband see's it and possibly veto's it! 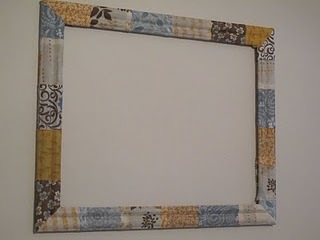 So, remember this fabric mod podge frame I posted a while back? Well, that was way back in July and that poor frame (that I was/am so proud of) has been sitting there all empty on our wall ever since. I've been waiting, thinking, pondering...what to put in this frame? It originally had a mirror inside, but I broke that. Oops. I tried putting one of our wedding pictures in there, but it just didn't look right. We considered some sort of vinyl quote, but couldn't think of anything that wasn't too cheesy. This beautiful wall art was done by the blog Billie Monster. She's an artist, can you tell? Anyways, I love this! 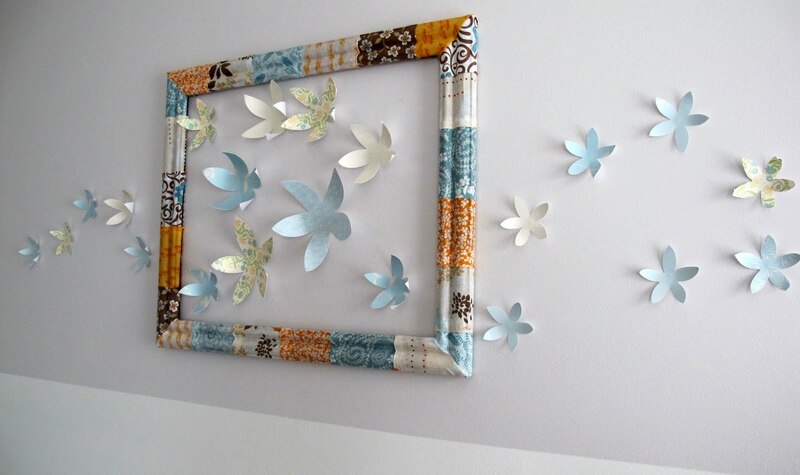 I know that 3d paper art is gaining popularity right now. 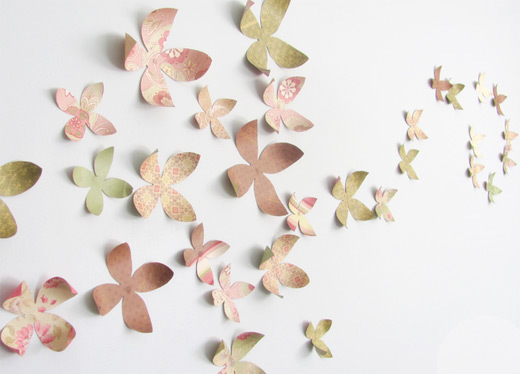 I especially have loved the butterfly wall art that I've seen for a little girls room. I just had to see if it could work. I am trying to get more use out of my Cricut lately and this was the perfect opportunity. I just cut out various sizes and color patterns from scrapbook paper. I used a 5 pointed flower pattern. In Billie Monsters tutorial, she used a pencil to roll the edges of the flower petals. My petals rolled up on their own while peeling them from the sticky cutting mat. 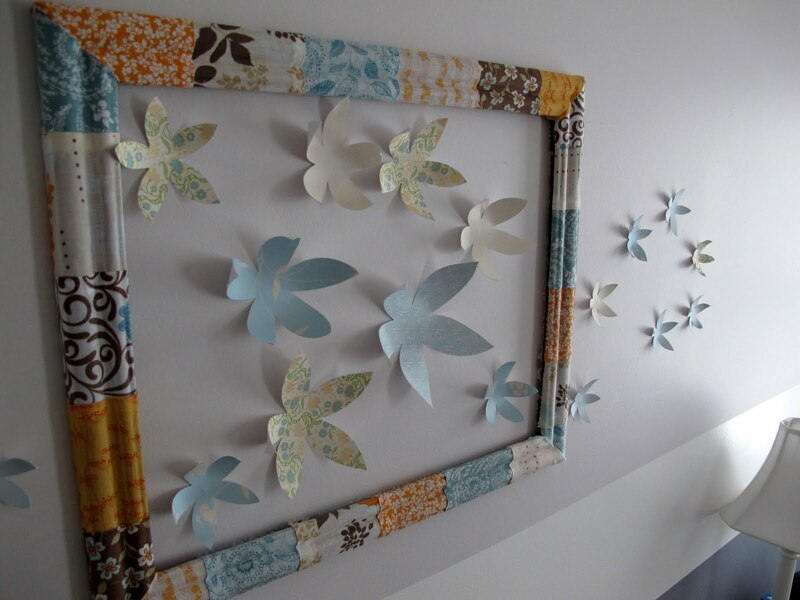 To attach my flowers to the wall I just used glue dots instead of thumb tacks. I didn't want to make lots of little holes in the wall in case the dear husband decides this is too girly. They seem to stick pretty well so far. Is this wall art a keeper? Hey Lindsay! Thanks so much for stopping by Billie Monster! I'm so happy you tried the flowers - you did such a great job. I love the paper you choose as well. And, what a neat frame! I love love the colors. Love this! Need to do this in my daughters room. Great job! I love it!!! I would definitely keep it...ha ha ha! I had saved that idea in my EVERNOTE page. Do you use Evernote? It's fabulous to save all the good ideas we come across in Blogland. You should check it out! That way, I don't have to go back & try to find stuff that I like & be utterly frustrated when I can't find them.